Yes, New York City can be jaw-dropping expensive, but among all the fat Manhattan wallets are fascinating and fun attractions that are 100% free. A new BBC article in partnership with Lonely Planet highlights 40 of these free attractions with pertinent details. Many are off the beaten track, like the African Burial Grounds, a Brooklyn Brewery, an old Dutch stone house that survived the Battle of Brooklyn and Public Boathouses offering free kayaking. You also won’t find big crowds at the Forbes Collection which houses a knockout collection of jeweled Fabergé eggs and poignant photos of Czar Nicholas II’s family in ornate royal frames in one room and for the kids, a large toy soldier collection in another. (Update: Unfortunately the Fabergé eggs have been sold in a private sale to a Russian. It’s good for them getting the eggs back, but I’m sorry we’ve lost such a beautiful collection). Happily you also won’t be fighting crowds at the National Museum of the American Indian where you’ll be treated to an unparalleled display of objects crafted by American Indians. Their beauty and sophisticated design may surprise you. Masters of beadwork decorating their clothes, moccasins and traveling possessions, Indians fashioned everyday baskets more elegant than any created since then. Equally exceptional is the exhibit’s imposing home — the spacious, richly appointed 1907 former US Customs House. Want to cruise around a posh Vanderbilt mansion on Fifth Avenue to see how the other half lived in earlier grander days? Simple. Zip over to the mansion’s new home as the Neue Galerie where you can get in free from 6 PM to 8 PM the first Friday of every month. (Free admission times at museums are often narrow windows calling for nimble planning.) If you’re a fan of the Austrian painter, Gustav Klimt, this gem of a museum is a must. Some of Klimt’s best masterpieces are showcased here, including his famous Portrait of Adele Bloch-Bauer I which the museum purchased for $135 million in 2006, the largest price ever paid for a painting till then. Painted in oil, silver and gold on canvas, it’s a radiant work of art. Why pay $12.00 for a boat tour to see the Statue of Liberty when you can walk a bit further along the harbor, jump on a Staten Island Ferry and see the statue for free. The ferry passes alongside the statue and if you stay on the right side of the boat as it pulls away from the dock you and your camera will have a perfect view. Planet Travel claims the ferry, “has long held the distinction as the single greatest free attraction on the Eastern Seaboard.” Absolutely correct! This ride is especially magical after dark with city lights blazing behind you as you plow into the harbor for an impressionistic passage surrounded by distant misty lights. And no matter how scorching the city gets in summer, there’s always a refreshing and reviving breeze on the crossings back and forth. Just in time for Spring and Summer travelers, the scaffolding around the newly cleaned New York Public library has been removed and with it, the great library’s dingy yellow color. Who knew the library, celebrating its 100th birthday, was faced with such dazzling white marble? The building’s Beaux Art interior is no less majestic, so take a stroll inside and imagine how it must have enthralled New Yorkers, especially newly arrived immigrants, entering that splendid space for the first time 100 years ago. 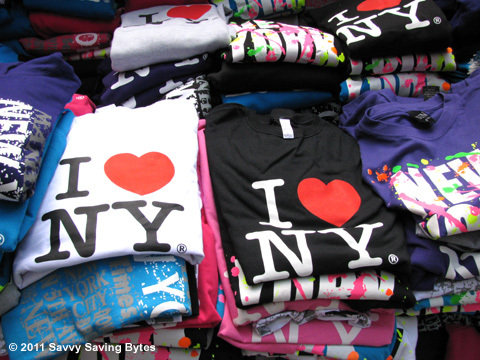 If you’ve enjoyed any additional freebies in New York not mentioned in the article, please share them in the comments. The Forbes collection and Neue Galerie both sound wonderful, and I never miss a visit to the New York Public Library when I’m in the city. The Fabergé eggs really are breathtaking. I haven’t been there in years and am hoping it’s still as sparsely visited as ever. And you won’t believe how pure white the library looks now. It was almost too white to photograph in the bright sun — couldn’t see details on that sculpture to the left of the front door. Think the cherry blossoms will be popping in the park this week. Yay! This is great information. I love the National Museum of the American Indian. People just don’t know about it, which is a shame. I miss New York, too. Hi Kate, There’s a dress worn by an Indian princess to absolutely die for in the museum. The cut, workmanship and beading are ravishing. The museum’s home, the old NY Customs House, was a revelation too. All that beautiful marble and curved staircases and enormous space that you don’t see anymore.